This clear vase is approximately 250mm (10")tall. The bubbles are mainly in the bottom half of the ball and randomly sized and spaced. 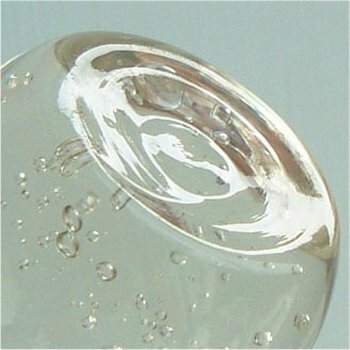 The bottom of the base is concave with two circular depressions (see image below). The stem has a bulbous shape at the base and a wide flare, approximately 41mm (1 and 5/8 of an inch) across the top. 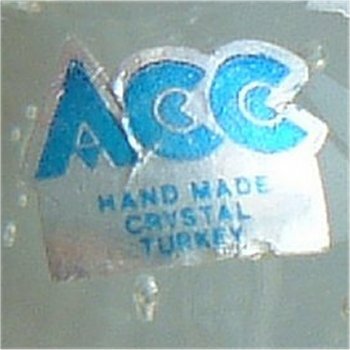 The paper label is metalic silver with blue lettering and states "ACC hand made crystal Turkey" (see image below) I have seen similar ACC labels on various other glass items which states they were made in Taiwan or Czechoslovakia, which suggests that ACC were an importer or distributor, and not the manufacturing company. See also Portugal for a similar shape.